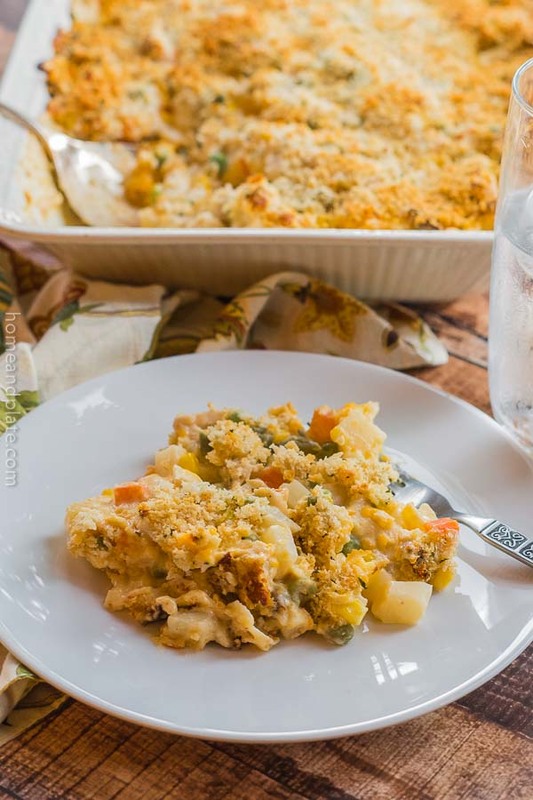 This casserole has tender bits of roasted chicken breast, hash brown potatoes, shredded cheddar cheese and your favorite mixed vegetables. 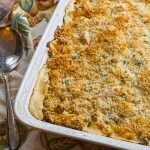 This easy cheesy hash brown chicken casserole hits the spot on a cold fall night. Can you say comfort food? 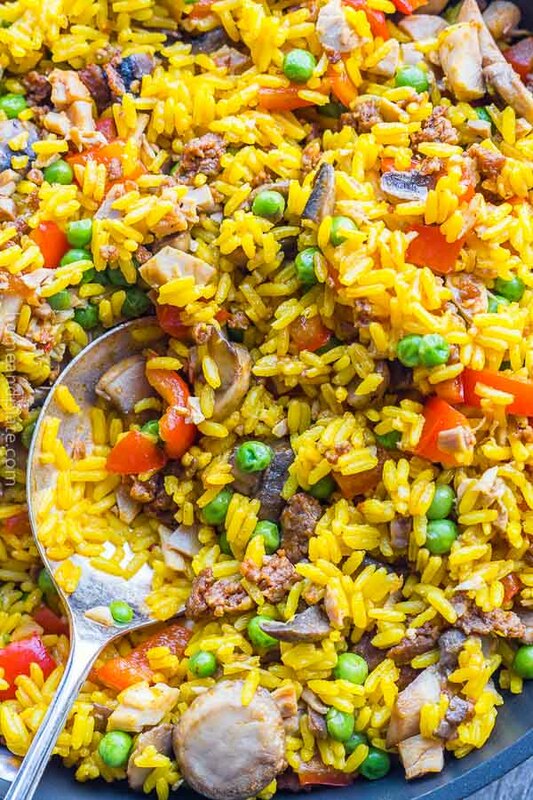 This recipe comes together so easily and is perfect for a midweek meal and there is always plenty left over for tomorrow. It’s crispy on top and cheesy delicious inside packed with protein. The great thing about this recipe is that it is no-fail! You can let it sit in a warm oven until you are ready to eat it. You may also enjoy my Buffalo Hash Brown Chicken Casserole if you like this recipe. It’s very similar but with the addition of Buffalo wing sauce to give it spicy flair. My husband, Brewster, is always asking for this dish. I usually pick up a rotisserie chicken at the grocery store and usually have the frozen vegetables stored in the freezer. 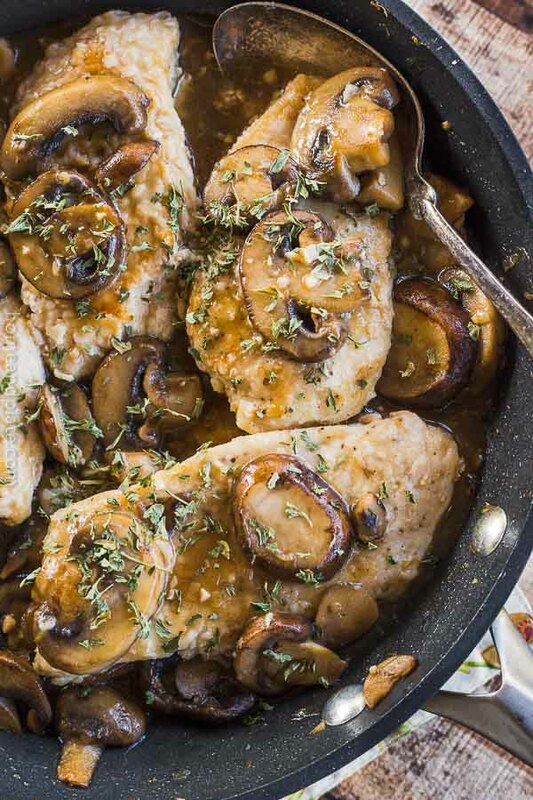 It’s also just as easy to cook up the chicken breasts ahead of time. Sometimes I will prep this in the morning so it’s ready to go in the oven at the end of the day. This casserole is also great for football season. We plan a lot of get-togethers for Ohio State football. That’s my team! I am a Buckeye fan and have had the privilege to see the team play every year. Who is your team? Let me know in the comments below. Sometimes I will make this casserole and also throw together a few other items like my Spinach Artichoke Dip and my Chorizo & Manchego Stuffed Mushrooms. Add it to your party planning and you can have a great spread to feed a crowd. This dish is a hit with our neighbor too! Trish and her daughter, Norah, stopped down to borrow Brewster’s notary skills and while visiting had a taste of this cheesy chicken delight. They loved it. Luckily there is always plenty to share. We invited them to stay for dinner and they happily accepted. The recipe makes more than enough. When the weather turns colder this dinner is a great way to warm up. I’ve even found ways to lighten it up if you are looking for healthier options. Just check out those suggestions in the comments below. Serve up this casserole with a side salad for a perfect family meal. I’ve also taken this dish to new moms home from the hospital because it freezes well. Just pop it in the oven for an hour and it’s done. 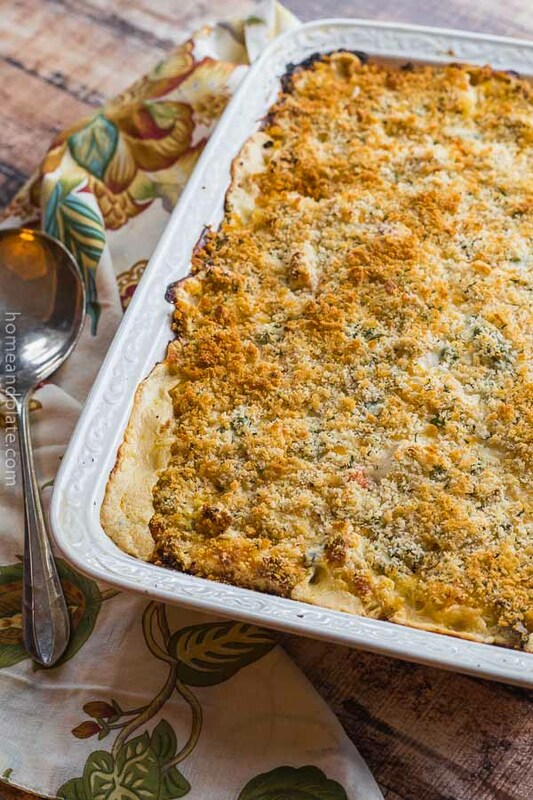 This hash brown chicken casserole has become one of my most popular recipes on Pinterest. It’s been pinned over 113,000 times. Be sure to follow me there for the latest recipes from my blog. Are you following me on Facebook? I post all my recipes there as well as other great recipes from my blogger friends. 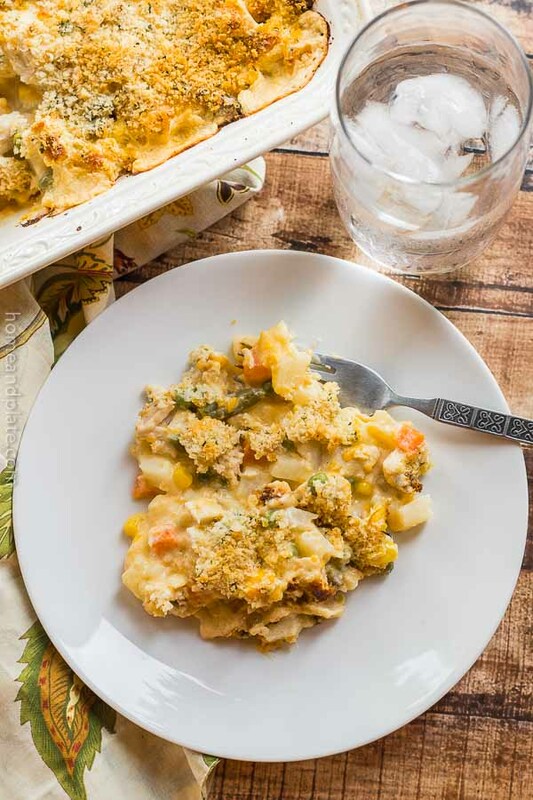 This easy cheesy hash brown chicken casserole hits the spot on a cold fall night. Can you say comfort food? Heat over to 400 degrees. Place potatoes in 9 by 13 pan. In a large bowl, mix well the remaining ingredients, except bread crumbs. Pour over potatoes. Sprinkle crumbs on top. Bake for 1 hour or until top is golden brown. Serves 12. Was wondering – is it supposed to be 2 lbs of hash browns or 2 cups? 2 lbs filled the entire 9×13 casserole dish? Assumed it was not supposed to be covered during cooking. Yes Juli you want to use a 32 ounce bag or a 2 pound bag. Sometimes I’ll mix all the ingredients in a bowl including the potatoes and pour it all in a casserole dish and top with breadcrumbs. Turns out just as delicious. Hope that helps. I hope you enjoy it. I don’t cover it while cooking. I like it toasty and crunching on top. Is there any way you can tell me amount of calories, fat and carbs? This looks delicious but I’ m counting calories. Do you thaw the hash browns first? I made this but changed it up. Instead of using frozen peas and carrots I diced and sauteed onion, celery and green/red bell peppers to add into the mix. Next time I’ll try your comment on substituting 4 oz. of lowfat cream cheese with chicken bouillon paste for the cream of chicken soup. Oh…Thanks for the recipe..It was really good! Sorry for changing it up. That’s awesome Susie…Love that you made this recipe your own. I love sharing recipes that my readers follow exactly but also thinks it’s fabulous to tweak it and make it something your very own. LOVE it! added frozen broccoli instead of peas and carrots. loved it. cooking the chicken then shredding it took more time. prob 30 min prep then 1hr 10min to cook hash browns frozen. Broccoli would be delicious in this casserole. Cooking the chicken would take extra time. Sometimes I’ll pick up a rotisserie bird to save some time. Thanks Holly. Glad you liked it. I have to say this was definitely a hit at my house tonight! Thank you so much for sharing this recipe! Since the grocery store I go to were out of tator tots – I used regular potatoes that I had at home instead. Peeled, cut in half and boiled using half water half homemade chicken stock then afterwards once they were done fried them a bit in some evoo and smashed them. The process was a bit longer but it was worth it! Also for the sour cream I used an organic kind – which wasn’t too sour + I picked it up cuz it was on sale! 🙂 and instead of regular bread crumbs all I had in my pantry was panko. Those were my only substitutions. I’m thinking this will definitely be one of those dishes making its way into the dinner rotation! Love this Sandra…make it your own. Any time you can improve on it is best, that’s my motto. And fresh is always best. Thanks and glad you enjoyed it. Would like" meals for one" recipes. Friends have passed away, and have few family members at a distance, so can use iteresting recipes for two. While I don’t have many recipes for one I do have a category on my blog called Dinner4Two. Many times it’s just my husband and me eating when our teens are at their evening activities. So I definitely understand. From the main navigation just click on "At Home" to find the site index. Then scroll down to Dinner4Two where you’ll find my growing list of recipes for two. Thanks so much for visiting. Sounds delicious! Do I need to thaw the potatoes and veggies beforehand? Nope you can cook it frozen just make sure you give it plenty of time to get good and steamy, about an hour or so in the oven. If you use thawed potatoes and veggies its can come out of the oven sooner, when it is bubbling and hot. Enjoy! I would like to bring this to a potluck a couple of hours away from where I live. If they do not have oven there to make it, would it work to do it in crockpot? How did you cook your chicken? I’m not the best at cooking chicken breasts. Amanda…you can bake two boneless chicken breasts at 350 for 30 minutes, slow simmer in water for 40 minutes or just pick up an already cooked rotisserie chicken at the grocer and just pull off the meat. So many options. Good luck! Hi Rai…yes it is two cups of sour cream. You can also substitute plain yogurt for the sour cream if you prefer a lower fat version. I sometimes use one cup of each. It depends on how creamy you want your dish. Just one cup of the sour cream is tasty enough for me. It is is loaded with so many other tasty ingredients you can’t go wrong. Hi Dianne… absolutely transfer to a larger pan 😊. Not all pans are the same depth. You really can’t mess this recipe up. The potatoes will cook down a bit but you can always put in less than what comes in a 2 pound bag to make it work for you. It’s still just as delicious. Enjoy. Made this last night as the recipe recommended,very good! Will defiantly make again. The one mentioned didn’t fit in a 9×13 pan,it does. The other said used Tator Tots,these are not the correct frozen potatoes to use,it is the diced (southern style) frozen potatoes. After making for the first time would do the same ,also a great recipe to add your own personal touches. I plan on making this tonight. I have shredded chicken that I made in the crockpot, but I am going to substitute shredded hashbrowns for the southern style as we all like them better at our house. I will try to post how it turns out! What a great substitution. I can’t wait to hear how it turns out. Hope you love it. why don’t you have a print feature? Thanks so much for sharing this! I came across your website from Pinterest! 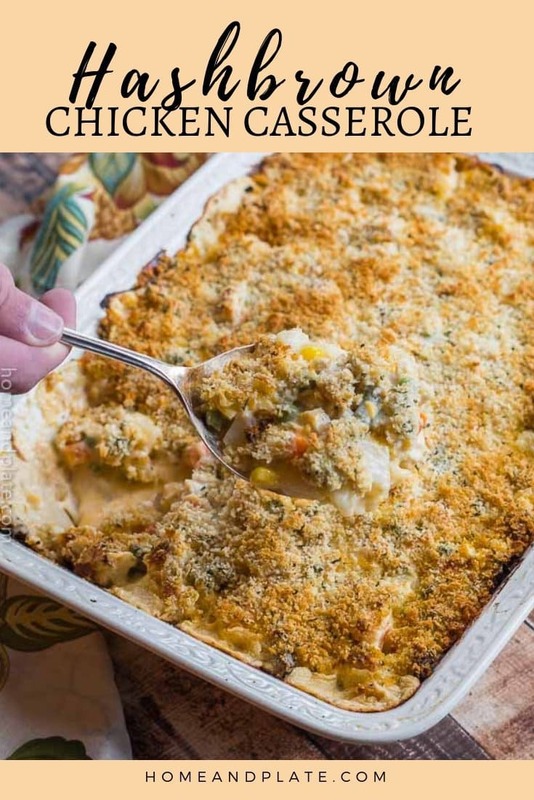 Tonight were making this except we are using shredded hash browns and I put the chicken in the crockpot last night, which made it shred easily and smells amazing! Thanks Heather for reaching out. I’m glad you liked the recipe. I love your idea for pulled chicken in the crockpot. That’s a great way to get tender chicken. There’s a step that says sprinkle crumbs on top… Is that plain bread crumbs? Thanks Brandy…yes…I have used plain bread crumbs but also I have used panko crumbs and corn flake crumbs as well. It’s a winner no matter what kind you use. Hope you like it 🙂 Thanks for visiting. Can you suggest an alternate ingredient for the sour cream/yogurt? I love one pan meals! Just curious if you think this would make a good freezer meal?? Im planning to do a bunch of freezer meals before baby comes and this seems like it would work nicely. Any suggestions on how to do it?? Yes this casserole freezes really well. It’s the perfect dish for when a new baby joins the family. You can cook it frozen for about a half an hour longer. Congratulations! Can I make it the night before without cooking it? I want to just throw it in the oven when I get home. Absolutely. You can make it the night before or even make it days ahead and freeze it and pull it out when you’re ready to cook it. Just keep it in the oven a bit longer until everything is hot and bubbly. Would it be ok to split this into 2 smaller pans and freeze one? Would it change the amount of time to bake it in the oven? Hi Julie. I split this recipe all the time. Bake this for the same amount of time or until everything is bubbly and hot. It freezes well. If you bake it frozen you’ll need to allow it to bake a little longer. Otherwise thaw it first before baking. Enjoy. Two questions….do I drain the canned corn before adding to mix? Or can I use fresh or frozen corn? Hi Retha. You can use fresh or frozen corn and that would be delicious. If you don’t have fresh or frozen then drained canned corn works in a pinch too. Enjoy! Do I need to cover with aluminum foil once I put it in the oven? It sounds like a great dish can’t wait to try it. Thank you!! Nope…if the top starts to brown to much then you can cover the casserole near the end of the cooking time. Enjoy it. Such a great recipe! So filling and hearty. I ended up adding more chicken than called for, so I probably should have added more milk. It was still delicious and I will be making it again and again!